Fall brings braising back into my kitchen, and my favorite thing to braise is pork shoulder. Not only does it make a spectacular meal in it’s own right, but it gives you the perfect material for follow-on dishes, whether chili or tacos or in last week’s case, a cassoulet-inspired peasant stew. There are a myriad of ways to braise pork. Two weeks ago, I did a dry rub of fennel seed, mustard seed, salt and black pepper, and braised the meat in white wine and onions for about 6 hours at 300F. This time around I did a simpler version of this chipotle port braise. For this recipe, I’m going to skip past the braising part and assume you have some delicious leftover pork shoulder to use. You’ll want a large dutch oven to make this dish. 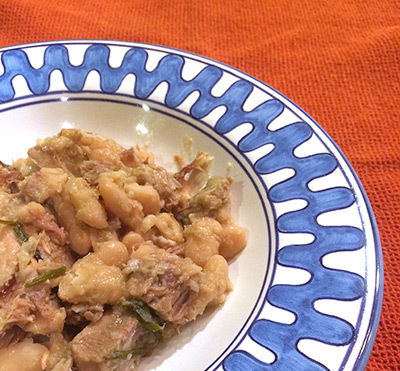 For the cassoulet, soak and then cook a pound of white beans — in my case, I used Rancho Gordo cassoulet beans which had a lovely size and texture. To cook, put the beans in a large pot, cover with about an inch of water, bring to a boil and then simmer uncovered until the beans are tender. Reserve a couple cups of the cooking liquid. Pre-heat your oven to 350F. Sear but do not fully cook a turkey thigh. Remove the skin and cut the turkey meat into bite-size chunks. If the kielbasa is pre-cooked, slice it into 3mm pieces. If it is not, brown the sausage in the dutch oven and then set to the side. Chop the pork into bite-size chunks. In the dutch oven, warm up some olive oil and saute the onions on medium-low heat until they start to turn translucent, and add in the garlic. Stir and do not let the garlic brown or burn. Gently stir in the beans, the meat (no need to do fancy layering), and the reserved cooking liquid from the beans. Stir in a half teaspoon of table salt or almost a full teaspoon if kosher salt. You will likely add more salt, but start here and add to taste. Tie up your bouquet garnis with kitchen string (or wrap in cheesecloth) and push into the middle. Add water — enough that it comes almost to the top level of the beans (some white wine would be nice too). Shift the pot, covered, to the oven. Cook for 20-30 minutes and lower heat to 325F. Cook for a couple of hours, tasting for salt level (just be careful that as the water level decreases, the salt intensity will increase). Sometimes with a dish like this, I will cook it uncovered to form more of a crust (with this approach, you will likely need to add more water), or I will add a layer of browned breadcrumbs, but I didn’t do either here and the dish still came out beautifully.